Successfully saved Spicy Pork Lettuce Wraps to your Calendar. You can also save the ingredients to your Grocery List. 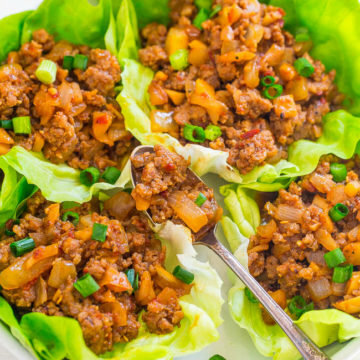 Spicy Pork Lettuce Wraps – EASY, ready in 20 minutes, perfectly SPICY yet wonderfully fresh!! Just enough heat to keep you going back for more! A new dinnertime WINNER! !